Posted on October 22, 2018, in Uncategorized, WWII and tagged 1940's, Airborne, Harry Truman, History, Military, Military History, Pacific, Pacific War, veterans, WW2, WWII. Bookmark the permalink. 110 Comments. Searching and researching for years. Hope you find some info you think is interesting. If nothing else – there’s always the military humor! 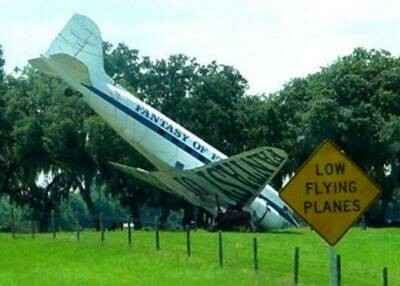 When they warn you that they’re low they REALLY mean it!!! is veranderd.Men blift die killers voort pproduceren en elkaar uitdagen..We hebben uit ht verleden niets geleerd of is men alles al vergeten? I think people choose to forget, but then are stuck in the path of repeating the same errors. But it also saved many more lives by dropping it – that’s why the debate will never be settled. Was he being serious that it was a snap of the fingers decision, or could he have been being ironic? I can’t imagine someone would take that sort of decision so lightly. If the former, how appalling. Can’t tell, Val. He had a bit of a Napoleon complex as far as I can tell, so he may have been exaggerating to show prowess. How easy it is to see the sheer folly of war . . . in retrospect. Centuries of war haven’t taught us anything. 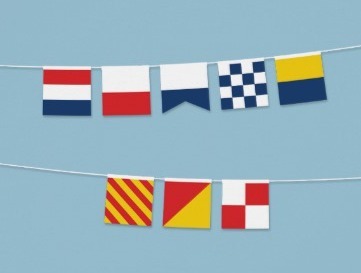 In fact, it is bitter irony that WW1 was dubbed ‘The war to end all wars’. The lesson was recognised, the lesson was studied, but the lesson wasn’t ultimately acted upon. Hmmm… suspicious is he poisoning death of Prince Kinoye. Truman was a great president. The bomb was a bad idea. It was shared with myself that the USA had a choice of dropping “thin man/fat boy” (excuse impulsive errors) on the Nazis but instead choice the least threat (Japan) as a tester. And too, after the bombing, lots of illness came upon the USA and western world. When the Germans surrendered, the bomb was not yet completed, so we could not follow through on the original idea. The bomb was tested in New Mexico, USA – Japan was not a test. Tested right here at home. I don’t think the radiation burning and residual affects of the bomb were planned, no. I’ve never heard of any connection between polio and radiation poisoning. And i don’t think Europe was ever considered for testing, repairing Europe was already underway when the bomb was ready. In testing one might not have considered hidden affects. I don’t believe the testing was only at the completion of the bomb, but tested intermittently at each progressive step. Most certainly, but it was tested in New Mexico before it was ever sent to Japan. Surely, and step by step and many times over, to ensure for progress. This is greatly appreciated, Ian! I thank you very much for informing me. For each one we lose, the world is that much poorer. He will appear in the Farewell Salutes on Thursday. I suppose we’ll debate the ethical and moral issues forever. But what really caught me this time were the photos of the bombs. They look so small and ordinary, without even a hint of what they were capable of. Well, except for the secrecy. That would have been a hint — but only that. I don’t think anyone — including Truman — could have anticipated what actually happened when those bombs were dropped. Have you seen any of the videos of wildflowers blooming in Nagasaki and Hiroshima now? Here’s one. Thank you, Linda. It restores my faith in Mother Nature as she repairs her scorched ground. They are beautiful sights! No matter the rights and wrongs of the decision, I just feel immeasurably sad when I read this. Indeed, Gwen. Some cheer, some cry – that’s why it is still a subject up for debate and I believe it will be for a very long time. Thank you very much, Koji. It was so nice of that station to include a video. You knew I’d tear up seeing that 11th Airborne badge on his shoulder!! All of the attention goes to the bomb but in actual fact far more civilians were killed by the series of raids on various Japanese cities using fire bombs of various types. They seem to have been forgotten. I read recently that if your enemy treats your prisoners decently and behaves in a civilised fashion overall, then you tend to be the same. The Japanese, by their thousands of war crimes, lost all claim to humane treatment when they were on the losing side. I have tried to tell people that the fire bombs did as much damage. I have a picture of both Tokyo (fire raids) and Hiroshima (A-Bomb) and you can not tell the difference. It will be posted in the August 1945 posts. Nice photos. Am I correct to say the Enola Gay is hanging in the Smithsonian? I believe I saw it at the Air & Space Museum, a fantastic place. You are quite right, Stephen. 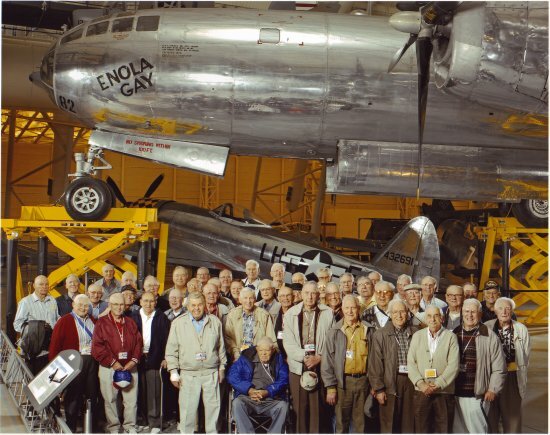 Such a historic item as the Enola Gay needs to be in our National Museum!! Such moments bring tears to my eyes. History does that. I enjoy historical novels, esp our (US) history. N Gingrich and partner have written wonderful hist novels of Amer Rev & Civil War. Brian Kilmeade has a couple of good ones and there’s a trilogy of the Civil War written by a father/son whose names escape me at the moment. Historical highway signs are fun to read but some of the best come from those personally involved. Keep up your good work! I have enjoyed many, but my father-in-law has me beat. He gives me an list every couple of months and I order the 10-30 books from Thriftbooks.com He thrives on historical fiction! Hard to believe the decision could be as quick as a snap of the fingers to drop a bomb of that magnitude. Was Truman on a power trip? We can only speculate if our little president had a Napoleon complex. I think that’s one of the main reasons this topic will continue to be up for debate for quite some time. It’s difficult second-guessing people and their actions at a time of war. I’m just glad I got to see both plane in person. It’s something to stand in front of the actual planes. A rush of history in a glance, eh? I’m jealous. The royal family had interesting, but IMO, sad lives. Such an interesting study – what went into making and dropping that bomb. I read the book “Last Train from Hiroshima” and it gave me nightmares for weeks. And on a lighter note, you ALWAYS get a laugh out of me with your military humor. This was and is a scary subject, hence children hiding their desks in the 1950’s and ’60’s. I’m glad the humor gets a smile. They sure do have a knack of getting a chuckle out of me! Anyone who has studied science knows the name of your brilliant scientist, Maria. You must be proud that he helped to save so many! The bomb is still a touchy subject for many, but Paul Tibbets was assigned a job of assembling a whole new unit (the 509th Composite Group), train them and drop the bomb on Japan. Back then, they gave you a job and you did it and Tibbets was only 17 seconds late in his delivery!! We had amazing people back then (in my opinion). Was MacArthur in favor of dropping the bomb. I read two books on him, but I don’t remember. 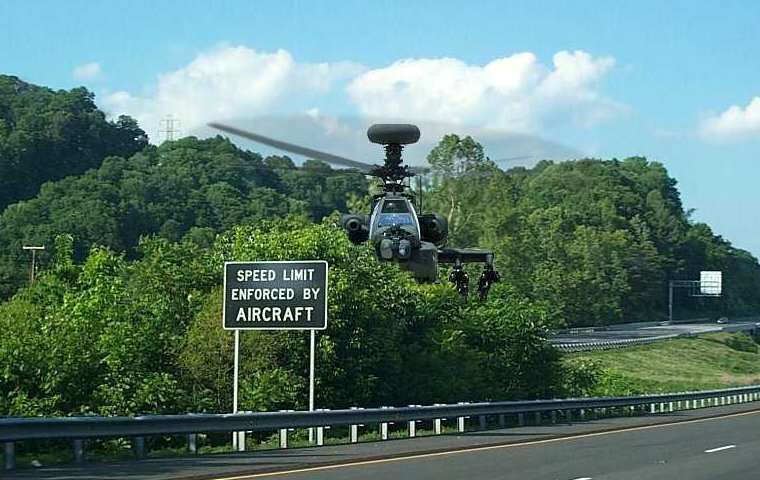 The cartoon of the “traffic enforcement” reminded me of going to the New England Airshow many years ago. Across runway from the tarmac, there were these little rolling hills. All of a sudden, five Apaches came up and around, flying straight toward the tarmac. Instantly, you realized how little time you would have if they were after you. To be honest, I don’t think I recall any mention of it. Perhaps he didn’t know about it either. Truman knew nothing until after his swearing in as Pres. I guess it’s possible he didn’t. These days of unthinking PCness it’s ‘the done thing’ to whimper and bleat about The Bomb and its use. But what was (if any) the alternative? Brrrr! Thank you, Yanks, for doing that—very much appreciated. You would love the book I’m reading right now – “Duty” by Bob Greene. Bob goes home to say goodbye to his dying father and ends up meeting Paul Tibbets!! Have just read a review … it looks like a powerful story. I’d add it to my list but sadly there’s already more there than I have years to read ’em all. It’s about time someone these days recognised Tibbets as ‘the guy who ended the war’… it wasn’t just him though—he was the guy who loosed that arrow but there were many hundreds who crafted it. Kismet, in fact. I knew nothing about Prince Konoye, so I looked him up. Very interesting. The family had interesting, but (IMO) sad lives. I didn’t know that it was an easy decision for him and am glad to hear it. I guess when you know all the facts, have all the evidence, the right answer pops up. That’s a leader. I’m wondering if he did it for the right reason. The debate goes on, but there’s always a cost and in the end a difficult decision was made to prevent more losses on both sides. AS I told Rose, I wonder if there truly is a right or wrong answer to the debate. That’s why I so often play “devil’s advocate” to hear all sides of any debate or discussion. It must be horrible to see that “huge mushroom” coming up and the destruction it wrought but there would be more deaths and destruction on both sides if that bomb was not used. Truman was wise to use it and end the war. This will always be a matter up for debate – I wonder if there truly is a right answer. Maybe not. But I’m afraid I can never be PC on this issue. After reading Japan’s War by Edwin P. Hoyt, I’m more convinced that Truman did the right thing. The Japanese military wanted to fight to the end in spite of the Emperor’s wishes to surrender. It was a different mentality. After what my countrymen and especially my mother’s family suffered from the Japanese, nobody can convince me that it was wrong to drop the bomb. Thank you for letting me know your research on the matter, Rose. I appreciate you taking the time to comment on this. There’s actually a really good YouTube vid that was just released (I can’t remember the guys name right now), but he asks why is that Nazi’s are always demonized, but the Japanese aren’t. The gist of that is because the vast majority of the powers that be were still in and still are in power…. I don’t want to bastardize that vid, so I’ll leave it at that (except, I’ll point out one more thing, it mentions all the horrific atrocities the imperial army waged on Asia). That huge mushroom really is little different (aside from novelty) than all the other millions of mushrooms from those years. All horrible. President Truman appears to me to have been a man without a conscience. How can anyone take the decision to use the A-bomb so lightly?! 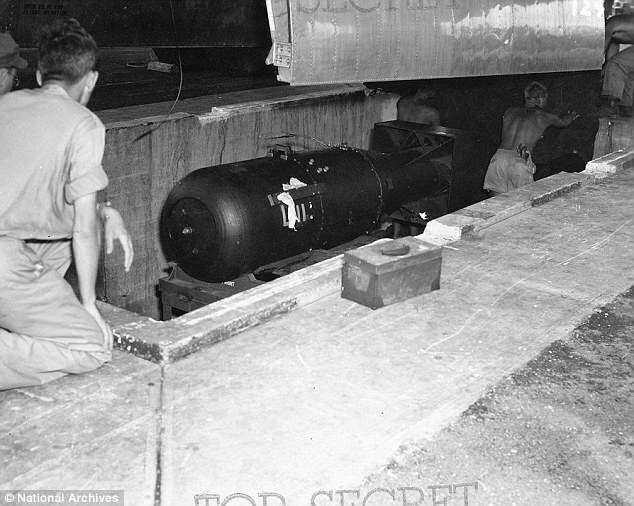 For one thing, FDR spent billions on the bomb, creating whole secret cities. Sooner or later Congress would find out about it (they were slow back then too haha). So, as I always say, no matter what the question, the answer is always – Money. He had to justify the expense. 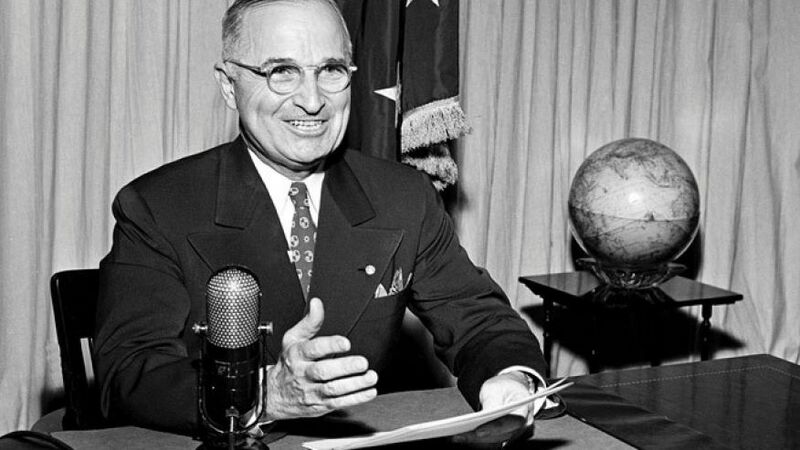 Your pic of Truman – Using the microphone as a gauge; he had hands whose size resembled a catchers mitt. He was a short man and those old microphones were a bit large. Always love the first person perspective you share GP Cox. Especially liked the archived pictures shared. Thank you! You are very welcome. I appreciate your visits. My father might not have survived the war without “The Bomb.” Truman made the right decision, IMHO. That is how most of us “children of the war” feel, but this will always be a matter up for debate. I believe in hindsight Truman wished he had not dropped the bomb. After they research both sides of the controversy, my students debate the infamous question: “Should we have or not have dropped the bomb.” Every year it is the same result. So much for the morality argument. Well, we know that running a politically correct war doesn’t win anything, as so blatantly apparent with Korea, Vietnam and our countless current conflicts. So the two bombs I believe will be up for debate eternally. Reading that Truman gave the matter so little thought not only further persuades me of what a mistake this was, it will also leave me sleepless, thinking of what rash decisions the current resident in the White House could make with so little thought and such long-lasting and horrific consequences. I think now that Truman already did the act of “pushing the button” it would not be done ever again so hastily. We can look back with the benefit of hindsight, and many modern commentators like to discuss the ethics of using the bombs. My uncle was a POW of the Japanese for almost three years. I know what he would say, if he was still alive. 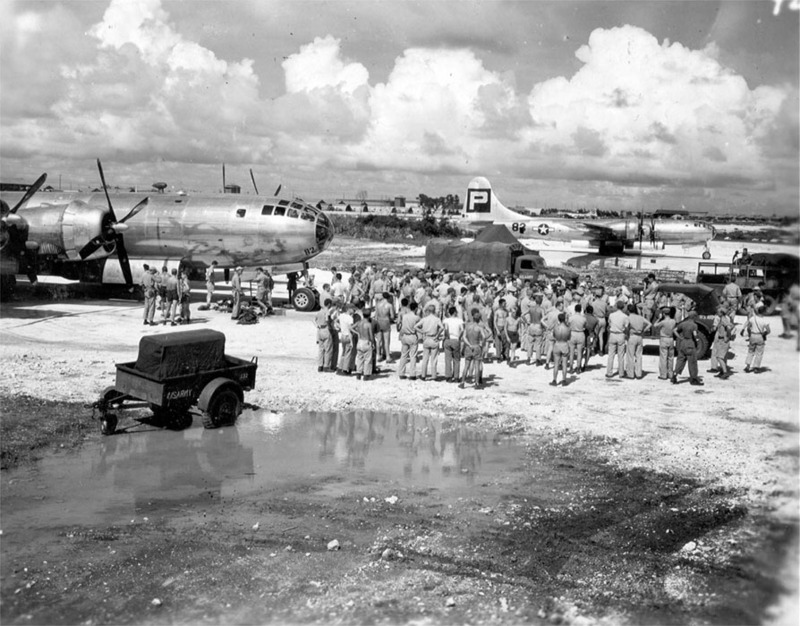 The 509th did indeed end the war in the Pacific. Well done to them. Thank you for stopping in, Pete. I like hearing the different opinions. He already knew we would be rebuilding Europe, feeding and housing their people, so I can only presume that he expected us to do the same for Japan. 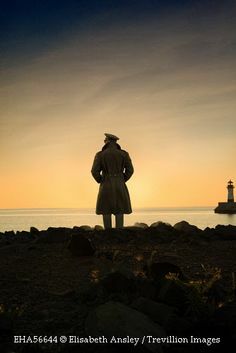 But he left it all to MacArthur to handle, I don’t think he cared to think about it.